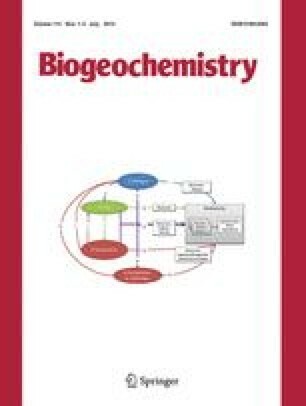 A synthesis of the biogeochemistry of S was done during 34 yr(1964–1965 to 1997–1998) in reference and human-manipulated forestecosystems of the Hubbard Brook Experimental Forest (HBEF), NH. There have beensignificant declines in concentration (−0.44µmol/liter-yr) and input (−5.44mol/ha-yr)of SO42− in atmospheric bulk wet deposition, and inconcentration(−0.64 µmol/liter-yr) an d output (−3.74mol/ha-yr) of SO42− in stream water ofthe HBEF since 1964. These changes arestrongly correlated with concurrent decreases in emissions of SO2from the source area for the HBEF. The concentration and input ofSO42− in bulk deposition ranged from a low of 13.1µmol/liter (1983–1984) and 211 mol/ha-yr(1997–1998) to a high of 34.7 µmol/liter(1965–1966) and 479 mol/ha-yr (1967–1968), with along-term mean of 23.9 µmol/liter and 336mol/ha-yr during 1964–1965 to 1997–1998. Despiterecentdeclines in concentrations, SO42− is the dominantanion in both bulk deposition and streamwater at HBEF. Dry deposition is difficult to measure, especially inmountainousterrain, but was estimated at 21% of bulk deposition. Thus, average totalatmospheric deposition was 491 and 323 mol/ha-yr during1964–1969 and 1993–1998, respectively. Based on the long-termδ34S pattern associated with anthropogenic emissions,SO42− deposition at HBEF is influenced by numerousSO2sources, but biogenic sources appear to be small. Annual throughfall plusstemflow in 1993–1994 was estimated at 346 molSO42−/ha. Aboveground litterfall, for thewatershed-ecosystemaveraged about 180 mol S/ha-yr, with highest inputs (190 molS/ha-yr) in the lower elevation, more deciduous forest zone. Weatheringrelease was calculated at a maximum of 50 mol S/ha-yr. Theconcentration and output of SO42− in stream waterranged from a low of 42.3µmol/liter (1996–1997) and 309 mol/ha-yr(1964–1965), to a high of 66.1 µmol/liter(1970–1971) and 849 mol/ha-yr (1973–1974), with along-term mean of 55.5 µmol/liter and 496mol/ha-yr during the 34 yrs of study. Gross outputs ofSO42− in stream water consistently exceeded inputsin bulkdeposition and were positively and significantly related to annualprecipitationand streamflow. The relation between gross SO42−output and annual streamflow changed with time asatmospheric inputs declined. In contrast to the pattern for bulk depositionconcentration, there was no seasonal pattern for streamSO42− concentration. Nevertheless, stream outputs ofSO42− were highly seasonal, peaking during springsnowmelt, andproducing a monthly cross-over pattern where net hydrologic flux (NHF) ispositive during summer and negative during the remainder of the year. Nosignificant elevational pattern in streamwaterSO42− concentration was observed. Mean annual,volume-weightedsoil water SO42− concentrations were relativelyuniform by soil horizon andacross landscape position. Based upon isotopic evidence, much of theSO42− entering HBEF in atmospheric depositioncycles throughvegetation and microbial biomass before being released to the soil solution andstream water. Gaseous emissions of S from watershed-ecosystems at HBEF areunquantified, but estimated to be very small. Organic S (carbon bonded andestersulfates) represents some 89% of the total S in soil at HBEF. Some 6% exists asphosphate extractable SO42− (PSO4).About 73% of the total S in the soilprofile at HBEF occurs in the Bs2 horizon, and some 9% occurs in the forestfloor. The residence time for S in the soil was calculated to be ∼9 yr, butonly a small portion of the total organic soil pool turns over relativelyquickly. The S content of above- and belowground biomass is about 2885mol/ha, of which some 3–5% is in standing dead trees. Yellowbirch, American beech and sugar maple accounted for 89% of the S in trees, with31% in branches, 27% in roots and 25% in the lightwood of boles. The pool of Sin living biomass increased from 1965 to 1982 due to biomass accretion, andremained relatively constant thereafter. Of current inputs to the availablenutrient compartment of the forest ecosystem, 50% is from atmospheric bulkdeposition, 24% from net soil release, 11% from dry deposition, 11% from rootexudates and 4% is from canopy leaching. Comparing ecosystem processes for Sfrom 1964–1969 to 1993–1998, atmospheric bulk deposition decreasedby 34%, stream output decreased by 10%, net annual biomass storage decreased by92%, and net soil release increased by 184% compared to the 1964–1969values. These changes are correlated with decreased emissions of SO2from the source area for the HBEF. Average, annual bulk deposition inputsexceeded streamwater outputs by 160.0 ± 75.3 SD molS/ha-yr,but average annual net ecosystem fluxes (NEF) were much smaller, mostlynegativeand highly variable during the 34 yr period (−54.3 ± 72.9 SDmol S/ha-yr; NEF range, +86.8 to −229.5). While severalmechanisms may explain this small discrepancy, the most likely are netdesorption of S and net mineralization of organic S largely associated with theforest floor. Our best estimates indicate that additional S from dry depositionand weathering release is probably small and that desorption accounts for about37% of the NEF imbalance and net mineralization probably accounts for theremainder (∼60%). Additional inputs from dry deposition would result fromunmeasured inputs of gaseous and particulate deposition directly to the forestfloor. The source of any unmeasured S input has important implications for therecovery of soils and streams in response to decreases in inputs of acidicdeposition. Sulfate is a dominant contributor to acid deposition at HBEF,seriously degrading aquatic and terrestrial ecosystems. Because of the strongrelation between SO2 emissions and concentrations ofSO42− in both atmospheric deposition and streamwater at HBEF,further reductions in SO2 emissions will be required to allowsignificant ecosystem recovery from the effects of acidic deposition. Thedestruction or removal of vegetation on experimental watershed-ecosystems atHBEF resulted in increased rates of organic matter decomposition andnitrification, a lowering of soil and streamwater pH, enhancedSO42− adsorption on mineral soil and smallerconcentrations andlosses of SO42− in stream water. With vegetationregrowth, this adsorbedSO42− is released from the soil, increasingconcentrations andfluxes of SO42− in drainage water. Streamwaterconcentration ofSO42− and gross annual output ofSO42−/ha are essentially the same throughout theHubbard BrookValley in watersheds varying in size by about 4 orders of magnitude, from 3 to3000 ha.